I hope you all have been enjoying my first collaboration week. It was a pleasure to have them here. Neat and Tangled really pampered me with providing with their wonderful stamp sets. Due to the weather my package was a little late. So I just completed this card in hopes of participated at the end. I created the background using the Clouds stamp set and a lot of masking. 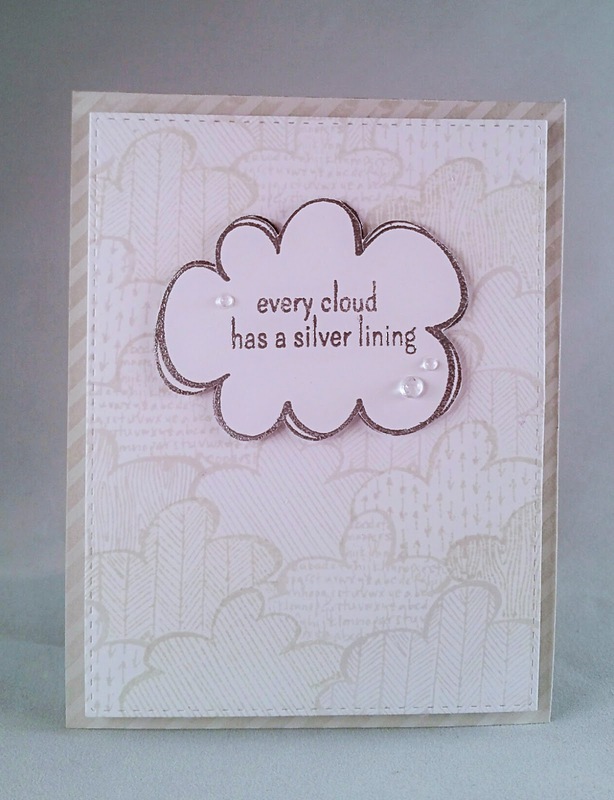 The sentiment from that same set was stamped on the cloud on the Just Thinking of You stamp set. This card is a great reminder to me that when things are tough that there is always something good hiding in it. Sometimes, I focus on the dark and not the light. It is so easy to get wrapped up in the trouble and forget to look around at all the people that lift you up in encouragement. Neat and Tangled has been a great example of that silver lining. They did an awesome job this week with their talented design team. Especially, Miriam Prantner that orchestrated this whole collaboration. Thank you Neat and Tangled. The masking effect is so neat on this card. I think we are all guilty of focusing on the negatives of things now and again. I've thoroughly enjoyed this week, seeing and hearing how people find your product so very helpful. Its definitely something I would love to have myself and will keep following your blog to see what other amazing things you come up with!! LOVE your soft stamping, silver embossing and CHEERY message :) I confess that I struggle to stay focussed on all the good around me sometimes too, luckily being creative can be a productive distraction. THANK YOU for sharing your INKY INSPIRATION and tutorial - you sure made fast work of your stamping and masking!!! PS - CONGRATULATIONS again - your AWESOME MISTI is AMAZING and it won't be long there is one in EVERY craft room ALL OVER THE WORLD as an ESSENTIAL stamping tool!!! Gorgeous card, Iliana!! Love how the MISTI made the masking task much easier! inspiring. My wish list is sooooo long! Congratulations on the 2016 CHA award! It is definitely changing the stamping world and has helped my mother tremendously. With advancing Parkinsons' disease it has enabled her to continue her love of stamping and card making! What a difference this tool has made to her! There is a silver lining! Thank you!!! Beautiful card! I am saving my pennies to purchase a MISTI. I have a tremor in my hands which makes it difficult to get a good stamp. Of course, I make the most mistakes when there's no room for error, so I think that the MISTI would be a perfect addition to my crafting arsenal. Sweet card! I have enjoyed this week's collaboration and have been inspired by all the beautiful creations all week! Beautiful card and beautiful message! This week has been an amazing week of inspiration, thank you everyone! I am impressed with your masking skills, looks like MISTI to the rescue again!! Definitely on my Wants *and* my Needs lists! And I will also have to find that embellishment tool as well... Great job! Lovely sentiment and card.... I need to catch up on the previous cards. Thanks for today's inspiration! What a slick way to make that terrific background! Thanks again for sponsoring this fun hop! Love your card and the video is so informative!! Wow, that was a lot of masking, with great results! I need to get my hands on. MISTI! Thanks for an inspiring week! oh my that stamped background is fabulous.. such a pretty card..
Fabulous job on this card! Iliana, you have changed our lives for the better! I hardly stamp a sentiment without using my MISTI - this is a darling, sweet card, and a thoughtful message! Off to watch the video! Awesome card! Thanks for sharing your time, talents, and inspiration with us. Thanks for a great week! MISTI is number one on my wish list!!! all that masking makes my brain hurt! Lovely card and thanks for showing all the how-tos in making it! Great card!!!!! What a fun week. It has been a rough week so I really appreciate this sentiment. I absolutely love the sentiment! It's so true too! This looks like a card I would make. It's so cute. Nice job girl! I love this! The background is fantastic and a wonderful sentiment! Neat card with all the clouds! Thanks for sponsoring this fun hop. Enjoyed the videos. It was a great collaboration with Neat & Tangled and love your card. That sentiment is delightful and perfect for your background. I love this card! And this quote let me think to my fav book and movie, Silver Lining Playbooks! Amazing! Awesome background and a truer sentiment I've never heard! What is the name of the tool you used at the end to pick up and place rhinestones? Fabulous card! All that masking - yikes! Great job! I love your card. All the details really add to the simplicity of the design and make for a beautiful card.